Team Stryker is 100% back! I’m so sorry for those of you following the comic weekly that it’s been so erratic since the fall. I was almost ready to start posting new pages when my site crashed and had to be rebuilt from scratch. I apologize if some things are still off or missing. I’m still working on getting small things like the archives button back, but they are on their way. For now, if you’re looking for a specific page, just remember that doing teamstrykercomic.com/mission000page00 will always bring you to the page you want. 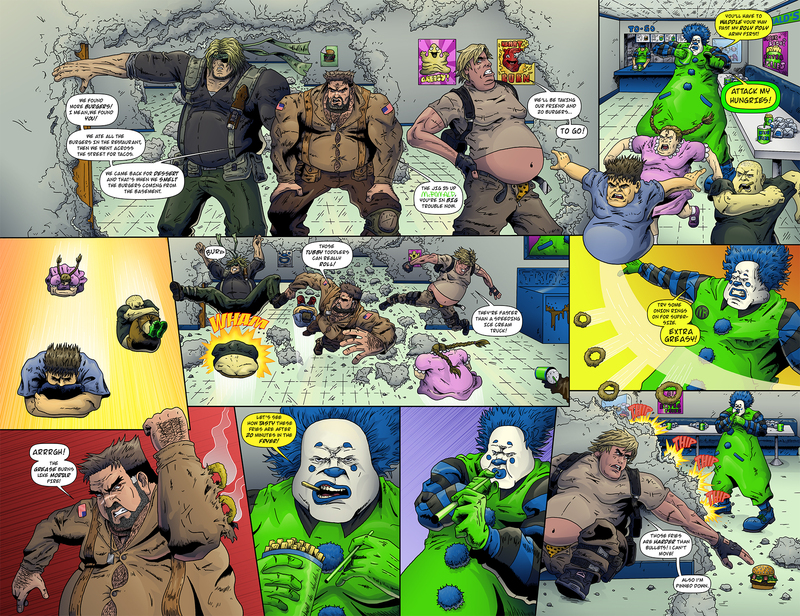 To mark the return of Team Stryker as weekly comic, I’ve got a two page spread that will hopefully make it up to you. This was a page that I drew, inked and colored on November, only to have my computer crash and lose all progress. I redid the inks and colors in March once I got my new computer. Hopefully once you start to see the new pages I’ve drawn, you’ll agree that the time away has only benefited Team Stryker. For the full res version of the two page spread click here. As always you can get all your Team Stryker updates on Facebook and Twitter. See you back here next Monday!